Actor Andrew Koenig, missing since February 14, was found dead in Vancouver, British Colombia, Thursday, a source close to the family told CNN. The body of the former “Growing Pains” star was found in a park, according to the source, who spoke to Koenig’s father after Koenig was informed of the discovery. The source asked not to be named because of the sensitivity of the matter. I couldn’t spend the day watching the health care summit but I did catch portions. Ultimately what might be the most important is the type of sound bites which make the evening news as very few people other than news junkies and policy wonks are likely to have watched even if they were able to spend the day doing so. I often heard Obama trying to stress areas of agreement but the Republicans did not seem to want to go along with this. 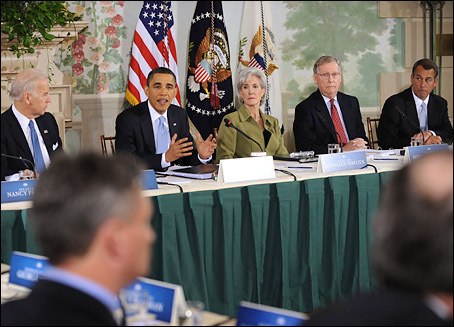 Obama appeared impressive in explaining the health care plan on several occasions. He had a good example to simply explain the importance of regulating what is contained in health insurance policies. He described how he once had an auto insurance policy for an old clunker which satisfied the legal requirement for auto insurance but didn’t actually pay to repair the car. While it might have been tolerable not to have coverage to repair an old clunker, it is a different matter when someone finds that their health insurance doesn’t cover treatment when they are sick. Yes, the CBO found health-care reform would reduce premiums. The issue gets confused because it also found that access to subsidies would encourage people to buy more comprehensive insurance, which would mean that the value of their insurance would be higher after reform than before it. But that’s not the same as insurance becoming more expensive: The fact that I could buy a nicer car after getting a better job suggests that cars are becoming pricier. The bottom line is that if you’re comparing two plans that are exactly the same, costs go down after reform. Klein could have made an even better argument than receiving a nicer car. The more comprehensive insurance could wind up saving money for many people. They would have lower out of pocket expenses when seeing a doctor, and no out of pocket for many preventative services. Most importantly, no body would be in the situation I have seen patients in where their health insurance fails to pay anything. I didn’t get a chance to hear much of the Republican arguments but I assume they repeated the same arguments which have often been debunked in the past. I do agree with their push for reforming malpractice, but this would have a minimal effect on overall health care costs. I recently discussed the argument for selling health insurance over state lines here. One Republican I did listen to criticized the amount of power granted to the Medicare Advisory Board, and I do share some of their concerns on this point. Republicans falsely claimed that using budget reconciliation would be something radical. As I discussed yesterday, budget reconciliation is commonly used to pass health care legislation by a simple majority, and this is far different from the “nuclear option” to change Senate rules previously threatened by the Republicans. I also heard comments that Obama should have held a bipartisan health care summit last year. Those saying this either have a very short memory or are hoping that others have forgotten that there was such a summit last March.